Grocery shopping can be a whole day event for us! 4 kids, 2 dogs, a husband, and a very very hungry mommy. We would go to a store and spend a few hours there, then realize that I needed a special thing from another store. After walking out exhausted, I would realize that I needed to grab those asparaguses on sale at the one store on the other side of town. At the end of the day, we were all grumpy and tired, with a car full of groceries and yet no dinner and no plans for it. Which usually drove us to grab some sort of food on the way home. More wasted time and money. Click the image above to shop for some special treats for your fur baby! Over the years, I have developed a skill to save us some precious time that we always seem to need. I’ve noticed that a lot of my mommy friends are always running out of time! we are all always wishing we had a few more hours, some more help, and a little more sleep! So I figured that it’s time to share a little of what makes our shopping easier. Find a place that has everything you need- The amount of time that you can save here is AMAZING. I have wasted so many hours and time and gas and patience by shopping in three or four different spots! I thought I was doing the smart thing. Until I found BJ’s Wholesale Club where I was able to find everything we need! In one-stop, one-trip and we are all done! They even accept manufacturers coupons. I can buy household needs, personal needs and food for! Even for our pets! Make a list- Always make a list! you have no idea of how much time we waste wandering around the store and buying things that we aren’t even sure if we need. By making a list, I also save money because I only buy exactly what I need and will use. Eat before you go- There is nothing more stressful than having 4 hungry kids, complaining at the store, and babies trying to eat everything they see. Or so I’ve heard :). I try to always get everyone fed and ready and just go! Don’t forget to feed yourself! I have also heard that a mommy can be extra grumpy and splurge more if she is hungry at the grocery store. I’m sorry to all the store workers, and my kids. Pack a snack- Even when you do your best. Even if they all claim to be so very full that they can’t take in another single bite. Most likely, when you are in the store, they will suddenly become so hungry that they can’t possibly go another minute without nourishment or else! Again, this might just be my kids, but just in case. Don’t forget the pets- It might just be me that forgets everything and anything. But I have also gotten all the way home from my all day shopping trip, only to realize that I forgot to run to the pet store for food or treats for our dogs. Let me tell you, if you are looking for a way to upset your children, this is it right here! Announce that you all need to get back in the car because you forgot the dog treats. 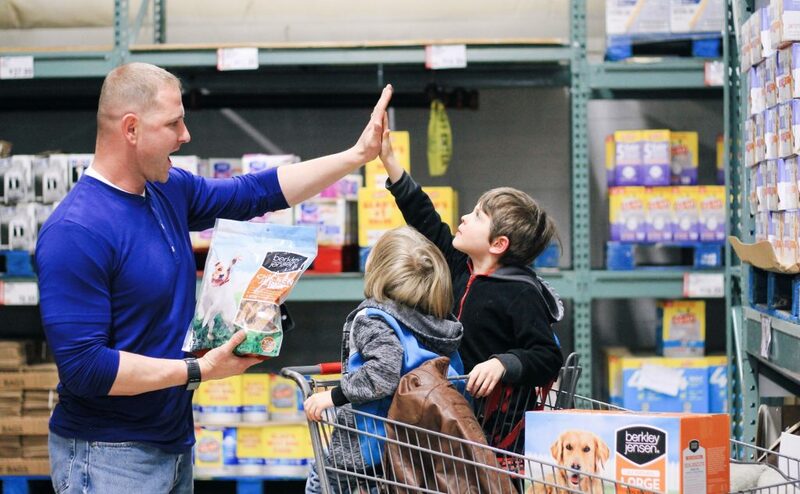 Pets are important members of the family, which is why BJ’s offers a wide assortment of food and accessories for your fur-babies at an unbeatable value. They have a large selection of leading national brands and specialty brands for pets, and the prices aren’t crazy so we don’t have to break the budget. Click the image above to shop for them now! The boys have been working with daddy on training the dog to do some fun tricks, so on this shopping trip, we looked for some special treats for them. I fell in love with BJ’s exclusive Berkley Jensen line of high-quality pet products which provides good nutrition and delicious motivation for the pups, all at an incredible price! Oliver and Hazel absolutely love the Berkley Jensen Chicken Jerky that we got them! And they are both crazy about the 14 lbs of Berkley Jensen dog biscuits that are baked with real chicken! They are both happy to do many tricks for them! Those are my 5 hacks! Do you have any special tips that I need to know about? I am all ears and ready to take notes! Please share in the comments area so that I can continue on my quest to make our grocery shopping a fun event. My kids and my sanity will forever thank you! From Wednesday to Sunday there are many food items demonstrated so you can sample new items before you buy them. Most of the items that you can sample have coupons to give you incentive to try and buy! I wish you were closer in Johnson City, TN. We don’t have one close to area.